Part of the world-renown Ferretti Group, Pershing Yachts have an unmistakable style that blends modern innovation in hull design with futuristic luxury that has left Pershing as one of the most popular yacht builders in the world. Founded in 1981 by Italian entrepreneurs Tilli Antonelli, Fausto Filippetti and Guiliano Onori, Pershing yachts was finally established in 1985 in an era that was fertile ground for visionaries and talented designers that spent their time imagining a new way of building boats. As new technologies and design innovations were being introduced to the world, Pershing Yachts was able to make use of these new elements that led to building some of the finest yachts in the industry. Built to be as fast as a powerboat, but as comfortable as a motoryacht, Pershing yachts started a new revolution with the Pershing 45. Pershing has established itself as being a leading builder of fiberglass sport yachts over the years and has no desire to imitate anyone else or even themselves. In the early 90s, the company expanded to international horizons and broke into the Mediterranean countries, the United States, and the Far East making the world become increasingly aware of their talented abilities. 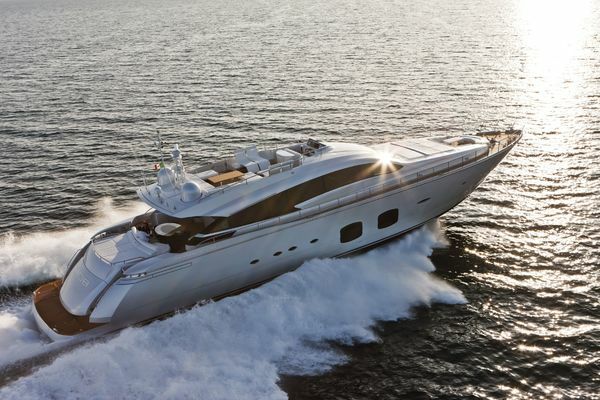 The company finally joined forces with the Ferretti Group in 1998 – becoming a part of one of the most highly known luxury yacht production companies in the world. 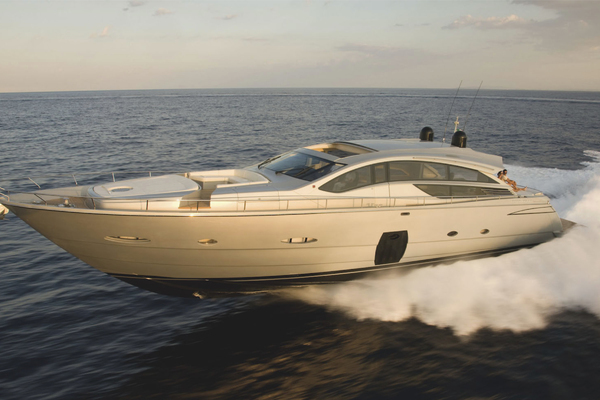 This ensued tremendous growth and continuous success for the Pershing name. 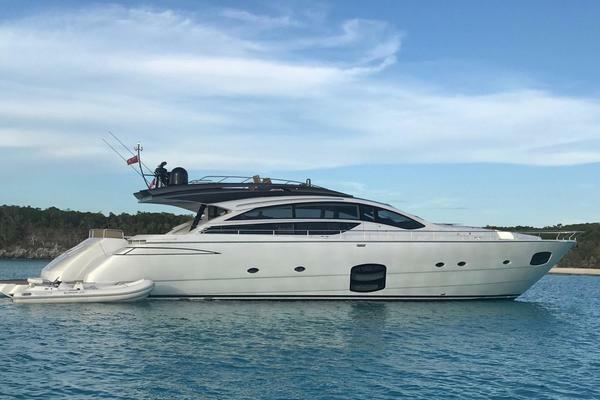 Opportunities were made when the Weichai group became the majority shareholder of the Ferretti group, allowing Pershing to make use of their financial strength, strategic vision and inventive qualities. As an ambassador of beauty and Italian style, Pershing has made several impressive design choices that have ultimately gone down in history – having livable accommodations and impressive speed. Several notable features include the hydraulic gangway introduced in their first model, the usage of vacuum infusion lamination system to create he fiberglass structure, large monolithic glazing, the optimization of space inside and outside, and of course the high level of personalization to each and every model offered to yacht owners. Innovation has been a key work in the Pershing vocabulary and they show no signs of stopping to discover new technological improvements that continually set new standards in terms of performance and comfort. 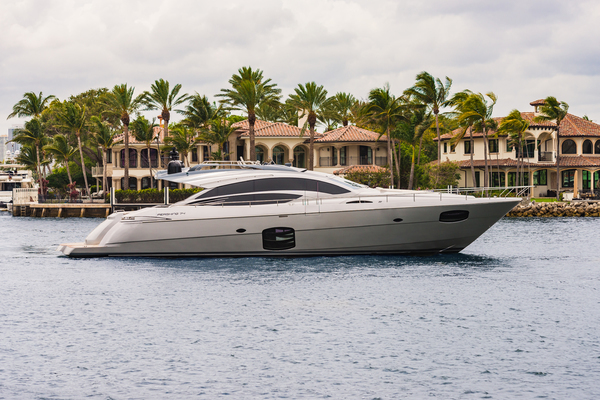 Pershing lives up to its name by building a yacht that exceeds all expectations with the Pershing 108’. Perishing’s often seem to defy the laws of physics – a bigger boat means a slower pace, but not for Pershing. 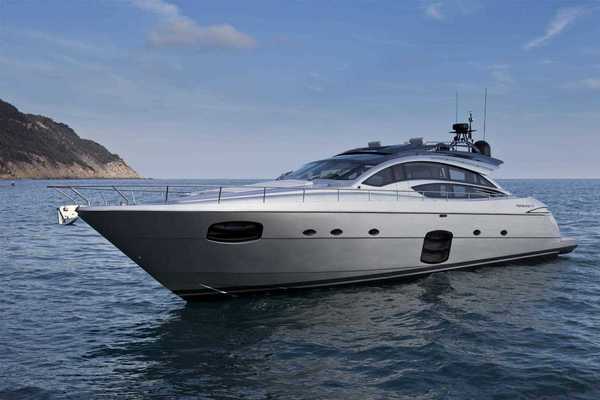 The 108 is nearly the heaviest Pershing yet, and can push speeds up to 40 knots. Although fast, she still exhibits large boat-like features by having a 22-foot beam providing plenty of scope. The three-cabin layout provides a roomy living space by also having a large square-set seating and aft dining table. Characterized with low cabinets and large glass areas, the deck remains deceptively simple with a rational big, feeling large and livable. The flybridge fits snugly into the profile of a 108, having sculpted side rails and a helm station (optional) that features foldout sun loungers, a large settee, foldout table, and barbeque center accommodating any boat goer. Three engines fit nicely within the engine compartment with good access to all maintenance points. Well-ordered and arranged, this engine room has very high engineering standards by having the auxiliaries in a separate compartment forward the main engine room acting as a great sound barrier. The design of a 108 makes a great deal of sense and with its high performance; this model is a must for those who appreciate quality and comfort. Crafted with innovation in mind, the 90’ highlights all the best elements of Pershing – aggressiveness, revolutionary design, and impressive speed. 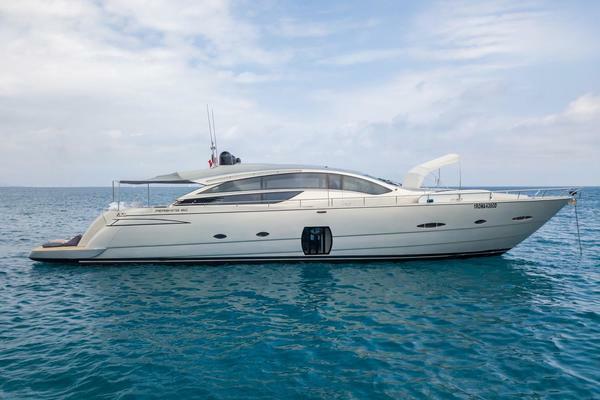 This mega yacht combines remarkable size with perfect seaworthiness making it one of a kind. Externally, the 90’ signifies its aggressiveness, but internally peace is the theme. The choice of luxury materials and innovative space solutions display a harmony of design throughout the model. The layout balances out nicely and includes many private spaces that are spacious and comfortable. Designed to be modern, but not minimalist – the 90’ optimizes the use of space to give added features. The airy saloon stretches a third of the length of the boat including double sliding glass doors that open onto the stern dining area, while the bow opens to the helm station that includes an aviation-style cockpit. Below deck you will see the cabins and lower lounge area that can be accessed from the main saloon. Throughout the cabin, the oak contrasts nicely with the wenge flooring, providing decorative details. This elegant, yet powerful model shows great design and exquisite craftsmanship. Built with a distinctly open personality, the 74’ Pershing includes stylistic features that make it known that Pershing keeps a close eye on their details. Offering a master cabin and two guest cabins, this model can host up to 6 guests, making it a great getaway on the water. The layout and design emphasizes elegance by having the quality of the furnishings throughout the vessel. With the salon doors and sunroof closed, the 74’ is also incredibly quiet, providing a nice smooth ride for all guests. Technology also plays an important role, starting from the loved foldaway door between the cockpit and living room – making the exterior and interior blend to create a spacious area. 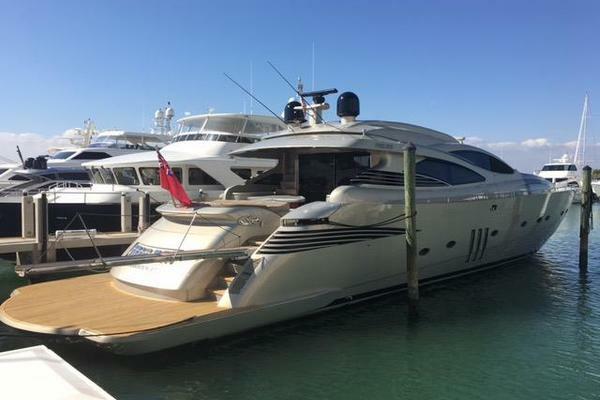 The retractable full-length hard top is also a key factor in the 74’ by having multiple purposes, including a retractable gangway, a swimming ladder and a docking staircase. This innovative model is one not to be missed. 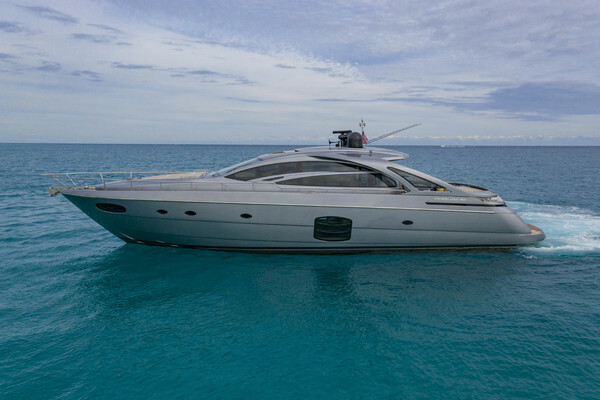 The Pershing 64’ is one that can handle challenging conditions, while still showing off its luxurious and capable qualities. Replacing the excellent 62 in the lineup, the 64’ was built to reinvent the brand with stylistic and technological advances. Defined with its new curves, the superstructure includes an extending cockpit overhang, a saloon bulkhead, along with workable and well-equipped galley that extends low on the portside providing ample space. New décor sweeps throughout the model, with plenty of daylight washing through to highlight the crisp minimalist interior design. In addition to its looks, the 64’ was built for high performance, being 6 tons heavier than the 62 as well as two feet longer on the same beam. A two-seat helm sits on the starboard side with a view stretching out to sea. Not only does the 64’ provide comfort and power, but it provides style for any boat owner.